Someone gave me the yarn. It was Reynolds Lopi in the undyed shade. It is a greyish, beigeish color and looked truly ugly in the skein. 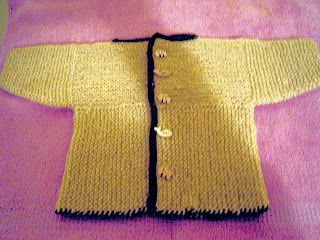 But I had seen this pattern in Sally Melville's book, The Knitting Experience 1: The Knit Stitch , an outstanding book. And I wanted to try it. I guess the Einstein Sweater is famous by now. I made mine in December of 2005. The yarn looked much better knit up. It doesn't look good in the photo at all, but it had a bit of 1950s sporty car-coat style that I liked. I wore it that winter and and the following year, spring, fall, and winter again. Then I washed it. It grew about five inches in length and some in width. Now I know why some knitting experts warn against garter stitch. Despite its oddness, I loved this coat and wanted to save it. So I felted it. A little. It seems like the same size now as originally, but I don't like it as much any more. 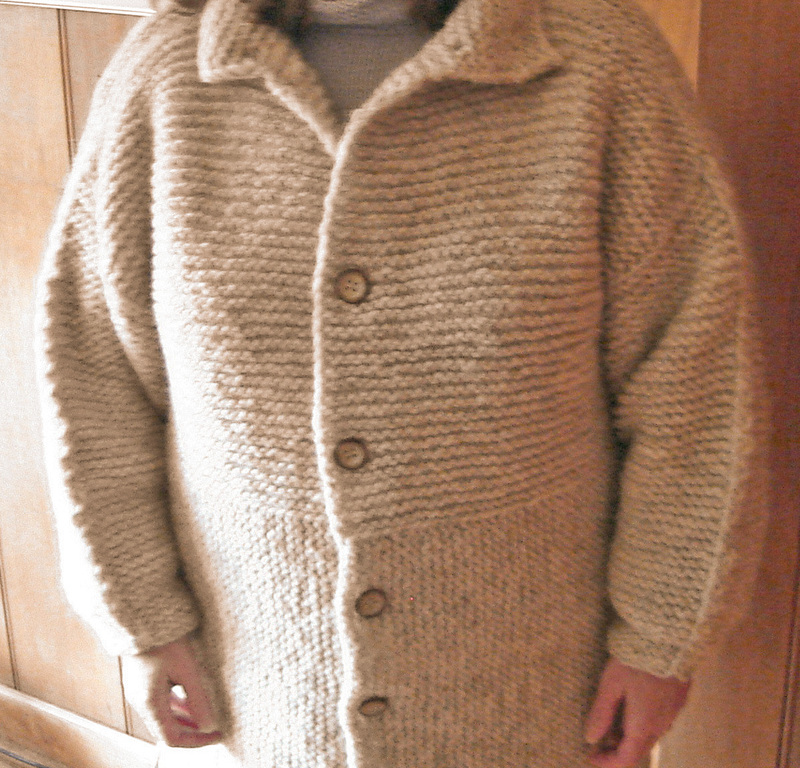 The wonder of Sally Melville's pattern is that it can be successfully made by a rank beginner, and it knits up fast for quick gratification. Besides the use of all garter stitch though, another problem with it is, obviously, those underarm wings. I know that many knitters have cleverly corrected the underarm bulk, but I didn't. 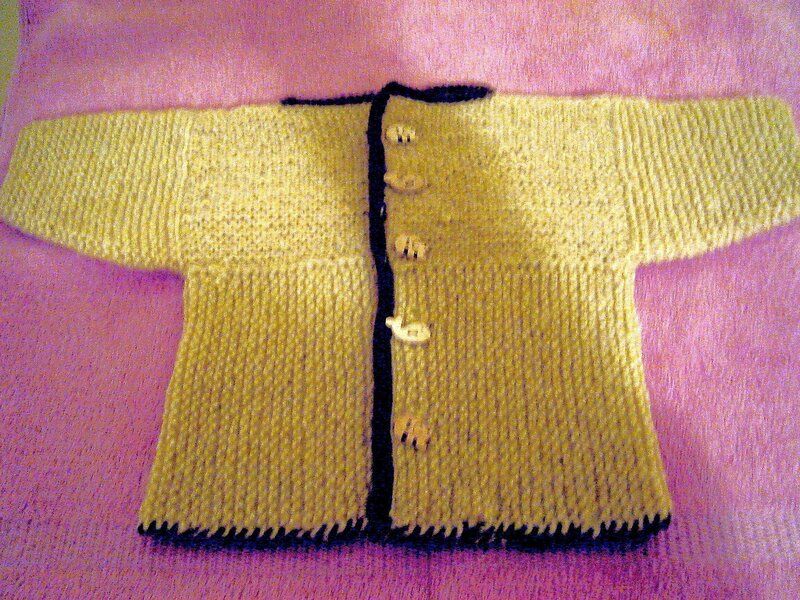 I like to knit patterns as they are written, thinking I can make a corrected version later, if need be. But I rarely do. I did make a baby version, though. Actually I made several, but I didn't have a camera for the first two. I worked on this one while flying to Berlin and bought the buttons (which are little whales and elephants) at a store in the Kreutzburg neighborhood that sells buttons and only buttons. How cute is that? What do you think of my Einstein and Albert? Have you made one too? Did yours grow? Please add your comments and let me know. Thanks! I think your Einstein and Albert are so cute! It's a shame about the unwanted growth of the coat after washing, but it still looks very nice in the picture. I really like the natural and neutral color you used, it goes with everything. I have yet to make one, but I might end up using the same yarn you used for yours. Thanks, Woollyworm! The color has really worked well. I still get compliments on it. You could do worse than use Reynolds Lopi. I don't think I would have the patience to sit there and knit an entire outerwear piece. Kudos to you!